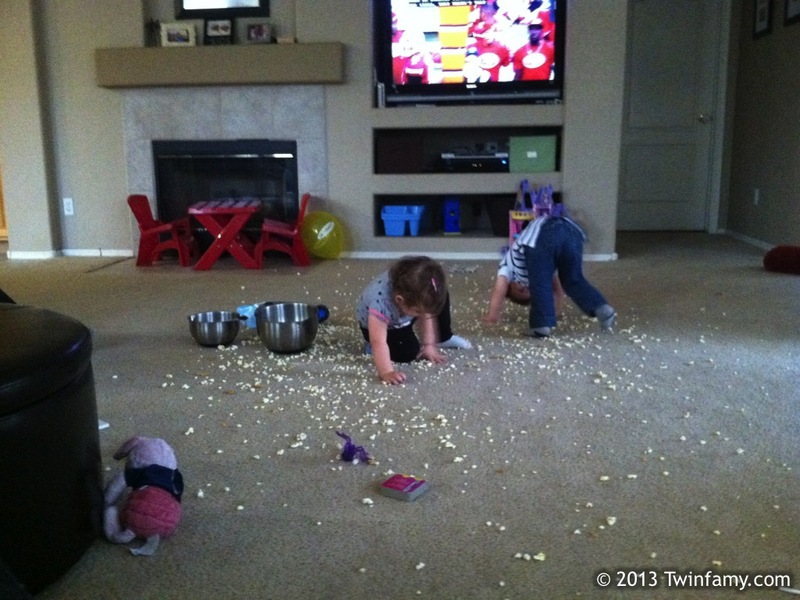 Yes, that’s popcorn on the floor. 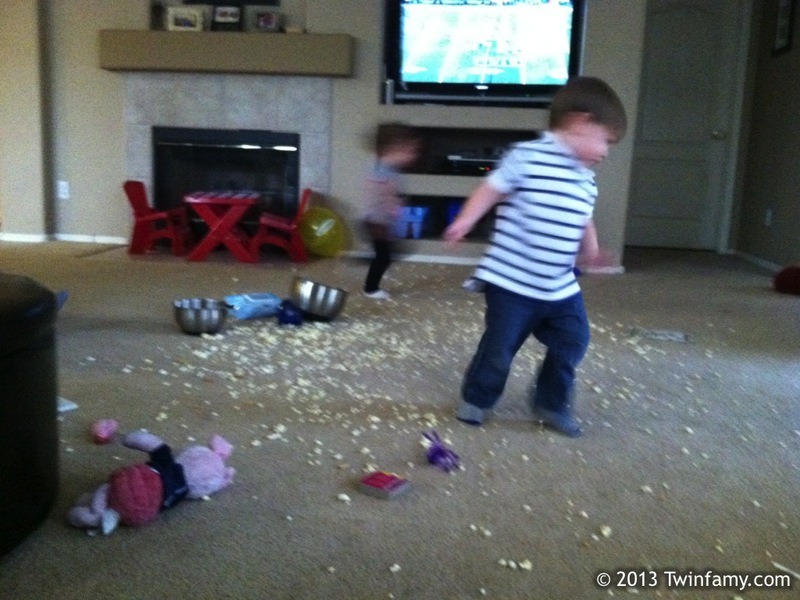 Yes, those are my kids doing somersaults in the popcorn on the floor. 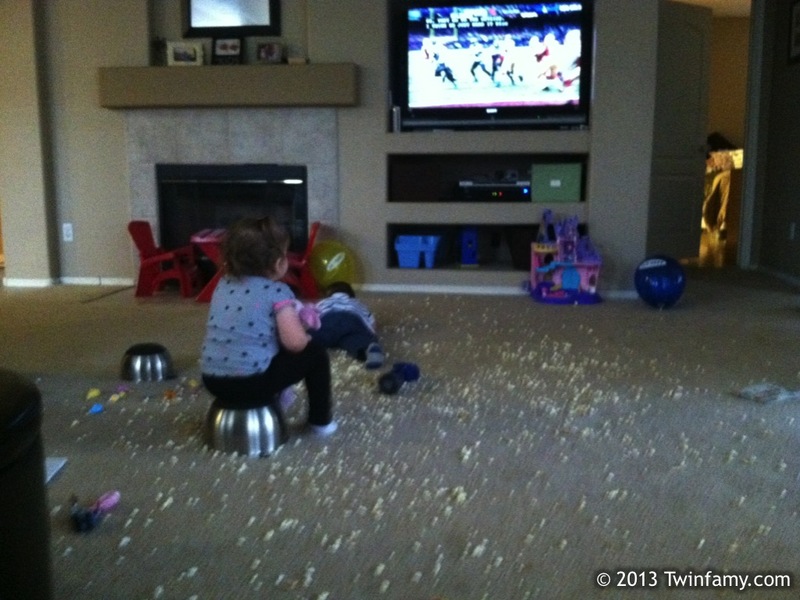 …and a popcorn bowl makes a great seat once you’ve tired yourself out. I heard this was an exciting play. If not, maybe your power’s out. Haha, it’s what YOU have to look forward to with the BOGOFs. How are things going? Look at all this squealing. I can only assume Twinfamy has achieved Beatlemania status. It’s about time. My mother always told me not to sit too close. Looks like I was listening after all. Twinmania has hit! Everyone in my house squealed as soon as I said, “OOH! A new Twinfamy post!” Then it turned to all out fangirl screams and jumping up and down when my twins saw yours. Still not sure if it was a, “Aww, baby!” or an “Oh baby!” when the girls saw your boy running. See? It’s just like the beginning of “A Hard Day’s Night,” with running boys and screaming females. It’s all happening. Omg, looove this! And also so glad this was not my mess! My hubby wouldnt have minded, much less noticed either. It was a small price to pay for the ability to actually watch the game. The kids were happy and it gave us a good 30 minutes of viewing time. And the best part was that all it took was a quick vacuum, and it was like it never happened. Win-win. Pic #3, downstage right – is that Piglet? It sure is! In this particular scene, Piglet is wearing another stuffed animal’s t-shirt, as my daughter insisted he was cold. Your party looks fun. We didn’t have any popcorn at ours, but there were cupcakes. Sans twins and somersaults, natch. I have no regrets. 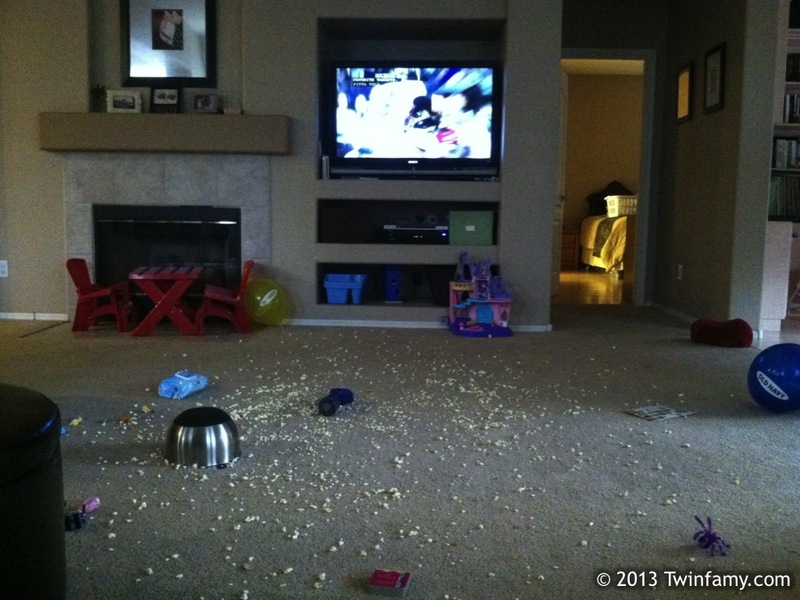 The kids had fun, and Mommy and Daddy got to watch the game. It was a win-win. An yes, the vacuum worked fantastically. It really only took about five minutes and we were good to go. 8-year-old twins, eh? Got any words of wisdom for rookies like us? I don’t always drink Mommy and Daddy’s Special Juice, but when I do, it’s rarely in front of Dos Niños. Believe it or not, I’m just getting ready to release my memoir entitled Twin Turbulence: What happened when twins happened. 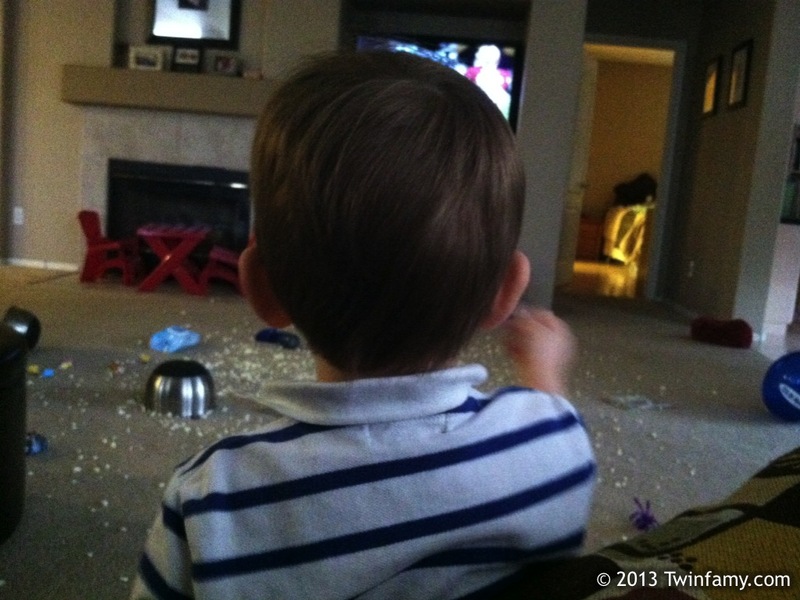 It’s a brutally honest account of our “popcorn-and-superbowl” adventures of raising our own twins, focusing through the age of 2. Look for it March 19th…you’ll probably get a kick out of it. Congratulations! Sounds like a fun read. I’ll have to check it out.